2018: Jötunn | FIRST Power Up! This years game was FIRST Power Up. The main objective was to place cubes on three scales. One alliance of three robots was randomly assigned a side of each scale. They would go against another alliance, and the alliance that gets the most points will win. For the 2018 robot, the drive system was the six wheel tank drive. The height of one scale was 6 feet tall; the team built an elevator to be able to reach that height and to pick up cubes on the floor. For the 2017 robot, a Mecanum Drive system powered by 4 motors was developed. The drive had proved many successes when sweeping across the field efficiently to grab and collect fuel and gears, the major objectives in FIRST Power Up. The team has made an great effort in improving the shooter mechanic on the robot but, had to use the fuel collector as a defensive strategy instead by ball hogging from other teams. The gear arm of the robot was the most valuable aspect of the robot. With an active gear arm Forseti was allowed to pick up gears quick and efficiently from the gear slots and floor pickup. With all of these components on the robot and the well planned strategy of running gears has provided Forseti as a fast gear collector. 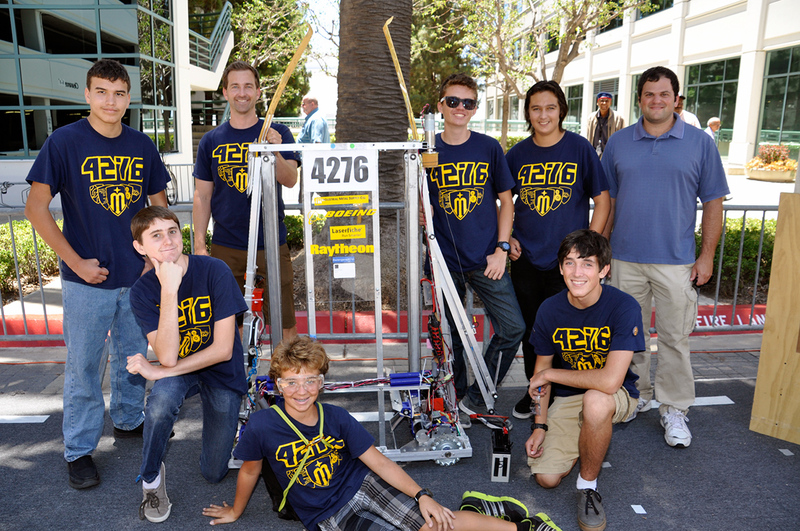 For the 2016 robot, a West Coast Drive system powered by six motors was developed. 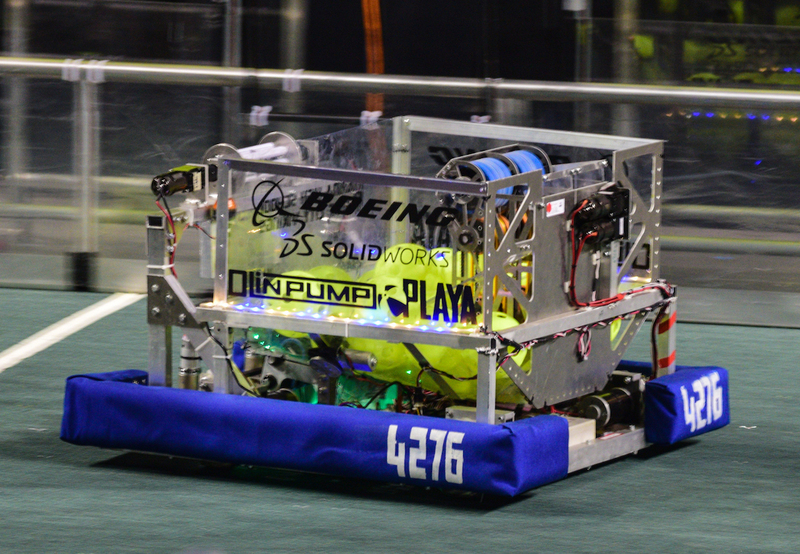 The drive was a huge advantage as the robot was able to cross most defenses, which was a major aspect of the 2016 game, Stronghold. Before the decision was settled on the West Coast Drive, the team thought about using a tank tread system. Two prototype drive systems were developed, and the drive that produced the best results was the West Coast Drive System. 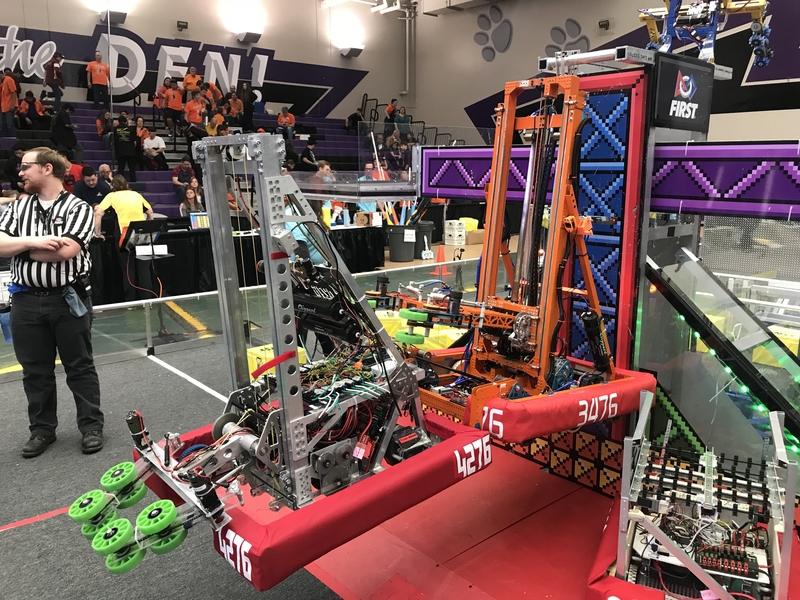 The drive system was not the only thing that took weeks to perfect; the arm of the robot that allowed us to score low goals and high goals in the 2016 game had many different versions developed before the team all agreed on one arm system. With previous versions of the arm, there were many challenges such as developing an accurate and consistent shooter and giving the arm the ability to help the robot cross defenses. Using mecanum wheels for superior mobility, Viking IV collects and stacks totes and recycling bins to score in the 2015 game, Recycle Rush. Boasting numerous 3D printed parts to maximize efficiency of optimizations and repairs. Among the 3D printed components, the main latches, responsible for raising the totes, have gone through many iterations of improvement until the final design was decided. In addition to modern 3D printed technologies, the robot also utilizes a live video feedback system with visual tracking, programmed especially for this system by our students and mentors. Another thing accomplished by our programming team: PID (Proportion Integral Derivative) control of lifter mechanism, physical feedback to the lifter operator, and numerous sensor array processing systems. Viking IV was a great robot for testing new ideas. 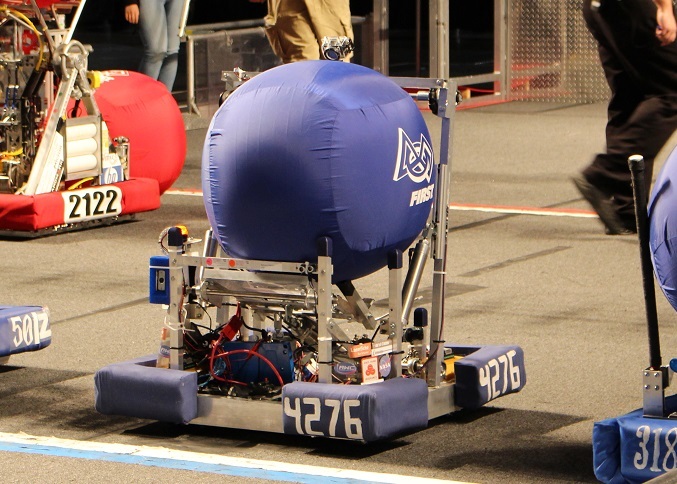 Making use of its mecanum wheel drive system for full mobility across the field, the robot uses separate rubber wheels to pull in the game ball, and with the help of pneumatic pistons, launches it into the air to score in the high goal for maximum points. The robot is equipped with a camera and is programmed to identify if it is at the ideal shooting range, which then activates an indicator light to notify the drivers, allowing for a perfect shot every time. Our robot the Behrooz Cruise is a popular demo robot. 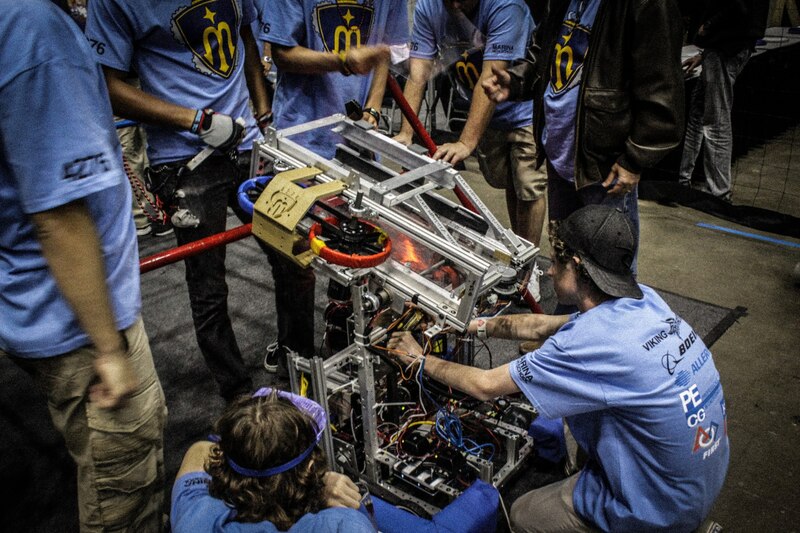 We love taking it to schools and events to show off what FIRST Robotics is all about. 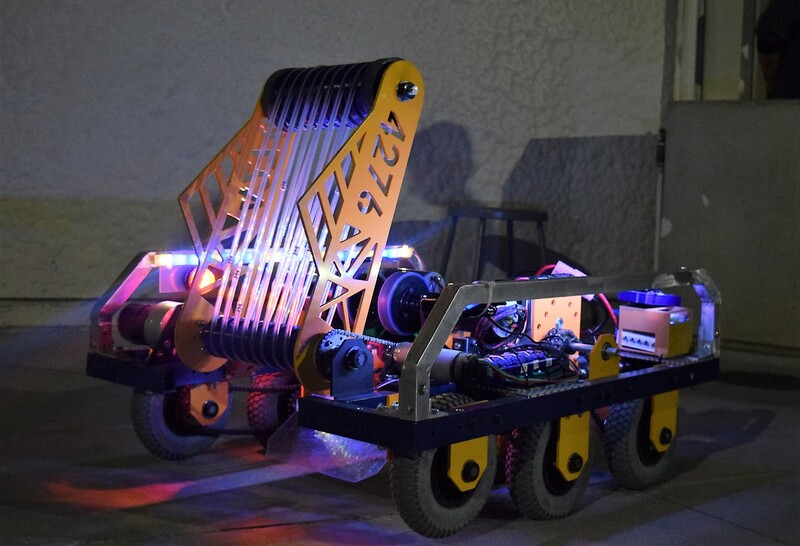 The 2013 robot balances traction and dexterity with a full set of omni-wheels to help it race from the feeding station to the other side of the playing field to shoot. Its CIM-motor-powered shooter is gravity fed and equipped with a hopper that allows it to hold the maximum number of Frisbees allowed by game rules. 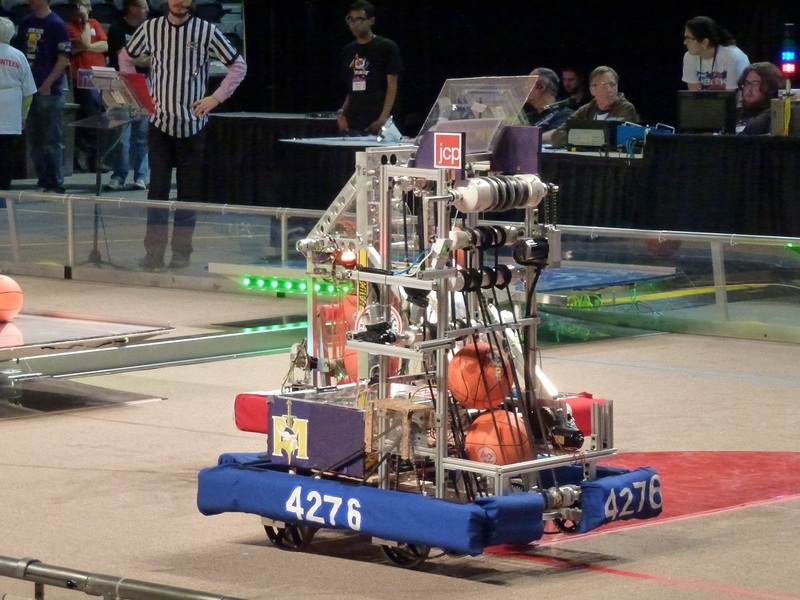 Its consistency during autonomous and manual control was a key source of points for its alliances during competitions. The extra 10 points from climbing the first level was achieved by a simple ramp and lock design that held it off the ground. Our very first robot, Jenny! She had two traction wheels in the rear, and two omni wheels in the front for ease of turning while still being able to push around the competition. A conveyer system was created using latex tubing and PVC pipes, enabling Jenny to pick up and store the game balls. A rapidly spinning PVC pipe wrapped in the latex launched the balls out of a chute, propelling Jenny to the top of the rankings as one of the best shooting robots. Jenny also had one arm, which she used to push down the ramp, allowing her to drive up and score the end game balance points.